All Saints is absolutely fascinating, and deserves to be better known. It may be overshadowed by neighbouring giants Cley, Blakeney and Salthouse, but how many people who visit those great ships come here as well? 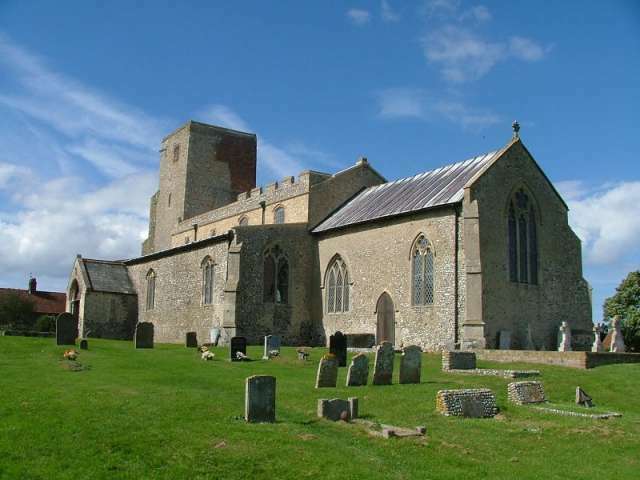 And having just come from Cley myself, there was something refreshing about All Saints because it is, to all intents and purposes, a typical rural village church. It sits on a rise above the busy Blakeney to Wells road. At first sight, it is an awkward building, as though a child had made a stab at a late 15th century church and had put everything in the right place, but not quite used the right shapes. The tower is actually very early, and the stark brick top is an 18th century repair after a lightning strike. But the delight is the window tracery, thoroughly un-East Anglian since, as at Cley, it predates the Black Death and does not reflect the later wealth of East Anglia. All of this is fascinating, but more fascinating still is the clerestory. On the south side, the most westerly windows are quatrefoils, and may be very early indeed; Mortlock thought 12th century, although this seems pushing it a bit. The same windows run the length of the north clerestory. But the other windows to the east are much later, probably early 16th century, and there is a battlement above them. These battlements extend westwards on both sides of the church about halfway down the line of the nave, but then they stop, although there appear to be fittings for another set of battlements immediately to the west of them. The guidebook suggests that these battlements were destroyed when the tower fell - but I don't think that can be right. It is hard for me to see how such a small amount of falling rubble could have done so much damage so far east without destroying the roof in between as well. And there are those Tudor windows as well. Either there has been a very awkward repair job, or an early 16th century westwards refurbishment of the clerestory was interrupted by the Protestant Reformation. Whatever, it is fascinating stuff. Your first sight on entering the church may well be the tympanum above the chancel arch. It carries a set of Royal Arms and a decalogue - that is to say, the Ten Commandments and the Lord's Prayer. It is badly in need of cleaning, and appears older than it actually is. In fact, it is one of the last Royal Arms and decalogue sets in England that was put in its proper place. Royal Arms and decalogues date from the Protestant Reformation, when an attempt was made to assert not only secular power of the state, but the basic catechism of the reformed church. The Victorians, in their attempt to restore the medieval integrity of English parish churches, relegated the Royal Arms to the backs of churches, decalogues sometimes ending up on the walls, or replaced with a new set around the altar. That didn't happen there. But the most interesting survivals here bear witness to the mindset of a different Church, in a different age. In the 15th century, there was an attempt to exert the official doctrine of the Catholic Church, probably in the face of local superstitions, of which there must have been many in remote East Anglia. 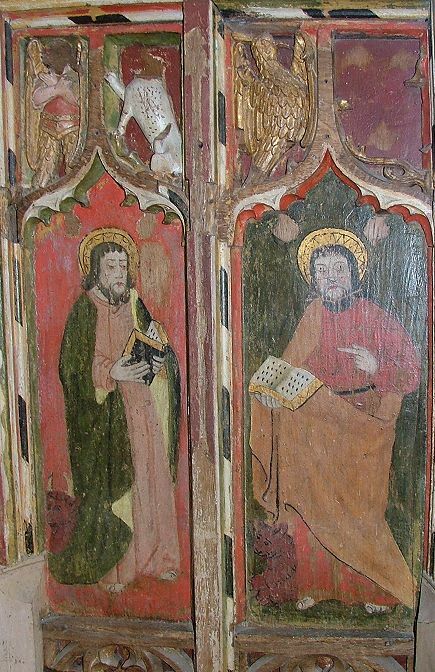 Fonts and screens of this time recall the faithful to theological basics, and the screen particularly demonstrates this well, with John, Matthew, Luke and Mark, the four evangelists, on the north side of the screen, and Gregory, Jerome, Ambrose and Augustine, the four doctors, on the south side. Notice how the papal tiara of Gregory and the cardinal's hat of Jerome have been scratched out, probably by Anglicans in the 16th century. These eight figures represent the fundamental Biblical and Ecclesial basis of the Catholic church. One interesting aspect of this screen is how deeply set it is, with very large spandrels above each Saint, with muscular carvings in them. These include a pelican in its piety, and the ones above Luke and Mark feature the evangelistic symbols of Matthew (not an angel, but a winged man), Luke (a bull) and John (an eagle) - the fourth should be the lion of Mark, but this has been lost. The evangelistic symbols are also on the font, and they alternate with four seated figures, who are usually taken to be the four evangelists, but might equally be intended to represent the Latin doctors. To be honest, I was a bit distracted by the knitted corpses around the base. There's so much else here. The corbels to the arcade, for example, and an unusually large number of ledger slabs. 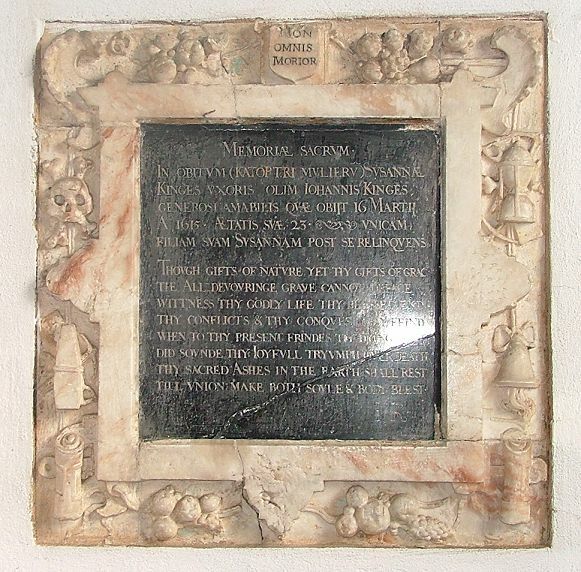 The Powdiche stone of 1647 is utterly charming. Best of all, the stunning 1615 memorial to Susanna Kinges at the east end of the south aisle, surrounded by marble symbols of mortality: a coffin being lowered into a grave, a skull and crossbones, a bell, an hourglass. I was also very impressed by the enthusiasm of the churchwarden who showed me around. He was extremely helpful and knowledgeable, giving up a half hour of his time for Tom and me, despite recognising me and expressing some doubt about my attitude to his home parish, Wingfield, on the Suffolk version of this site. He was, fortunately, very charitable.